There remains a huge amount to do in the fight to save the spoon-billed sandpiper. Please help us make every day count. £4,000 pays for one satellite tracking tag! You can donate online using your debit or credit card via WWT’s website, it’s quick, easy and secure. To donate just text SBSP15 £(amount) – replacing (amount) with what you wish to give, e.g. SBSP15 £30 – to 70070. Call our donation support team on +44 (0) 1453 891194 or 891195. Wildfowl and Wetlands Trust (WWT) is subscribed to CAF America, a US 501(c)(3) non-profit organisation EIN 43-1634280. Donations to CAF America from US taxpayers are tax deductable to the extent allowed by US law. Simply visit http://www.cafamerica.org, search for ‘Wildfowl & Wetlands Trust’, click Donate and write ‘SBS’ in the Grant Purpose Box. Raising awareness is really important to securing the future of spoon-billed sandpipers and the wetlands they depend on. We want everyone worldwide to know about the importance of intertidal wetlands in the East-Asian Australasian flyway not only for the millions of waterbirds that depend on them but also for people. As well as the benefits common to most wetlands – cycling nutrients, storing carbon, purifying water, absorbing pollutants and providing breeding and feeding grounds for many organisms – these coastal wetlands protect cities and local communities from the rise of sea levels and extreme weather events and they play an important role in supporting the economy of coastal regions and human well-being. You can help us deliver this message by talking and writing about spoon-billed sandpipers and wetlands. Find out about your local wetlands, and give a talk to a local interest group or submit an article to a local newspaper or magazine. If you’re a teacher, introduce your students to waterbirds, wetlands and migration – all topics that can be used to learn about geography, biology, chemistry, mathematics, culture and art. 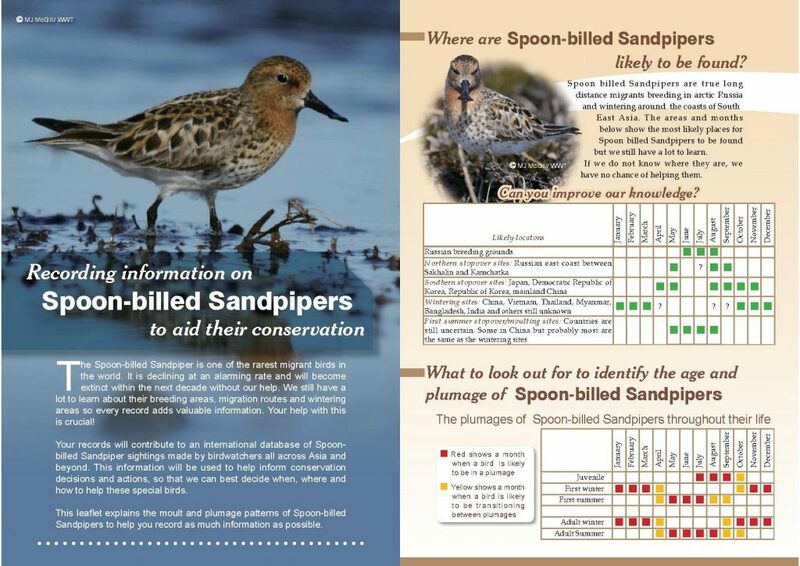 The Hong Kong Bird Watching Society (HKBWS), with the support of BirdLife’s “Welcome to the Birds” programme, has produced a poster about the spoon-billed sandpiper which can be downloaded here: English, Korean, Chinese. Do you use social media or are you a blogger? Join the conversation about spoon-billed sandpipers and wetlands online. You can help us by commenting on, posting, tweeting and sharing stories from this website as well as the websites and social media feeds of our partners and all those working to save wetlands. For example, in October and November 2016, the Paulson Institute published a series of fantastic blogs and videos about the importance of coastal wetlands in China. Here’s their blog on 5 Things to Know About China’s Coastal Wetlands. Get the latest project news by email as soon as it’s available by signing up here. If you’re lucky enough to see spoon-billed sandpipers, let us know! 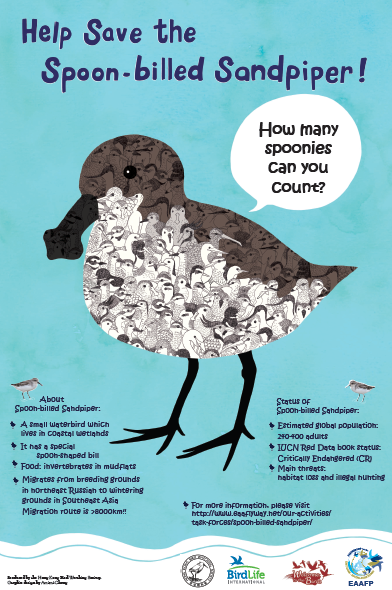 An important aspect of our work is monitoring spoon-billed sandpiper numbers and keeping track of the sites they use. Without this information conservation work would be impossible. While there are professionals out there looking for the birds, we also need help from local birdwatchers. This guide to recording spoon-billed sandpipers has all the information you should need: English, Korean, Thai, Chinese.